Choosing clothes is a simple task and often enjoyable, because shopping is life for many adults. We personally choose certain clothes because we know they are a reflection of who we are and serve as a subtle expression of characteristics that define us. It is liberating to wear something that you like and matches your personality. For kids, the freedom to choose the clothes they want to wear can have benefits far greater than to us adults. They are in their formative years, and the experience of freedom in as simple a thing as choosing clothes teaches them a number of values and gives them a taste of responsibility. A study from the University College of London concluded that excessive psychological control can lead to low life satisfaction and mental well-being. Psychological control is the restriction imposed by parents to children in terms of making decisions, invading privacy and limiting independence. While according to a research study published at the College of William and Mary, a kid’s level of freedom will determine the creativity he or she is capable of in the future. If the a child’s freedom is suppressed, the level of creativity declines. All these studies point to one conclusion: freedom in many aspects of child development is crucial to their well-being and will determine the kind of person they will be in adulthood. It can be hard for parents to swallow the idea of letting their children decide for themselves. Questions like what if they choose something that is deemed improper can be unnerving. Here are some significant reasons why freedom to choose clothes is valuable to your kids’ development. We cultivate our children because someday we want them to be able to look out for themselves and be as independent as they can. Letting your kid choose their clothes will allow them to be heard and feel like their opinions start to matter. When you can form your own opinion, you get the sense that you know what you want and what you need. From there you can build your principles and morals and cultivate your life philosophy. Independence is the freedom to live based on your own principles. No one wants to be confined in a space where you need to strive to be someone else and lose yourself. Giving freedom to let your children to choose clothes helps them define their individuality and develops their own style. You want your children to be themselves and be original. Encourage them to wear clothes that express their individuality. This is also a great way to show them respect. Letting your kids wear a shirt with their favorite cartoon character, or dress up as a Disney princess all day long, is not something you can readily do when you enter adulthood. Children sometimes throw fits in the morning, and getting ready for school is already stressful enough for you. Choose your battles and let them wear the clothes they want, within reason. Not only does this prevent you from getting stressed out but it also saves you time to take care of other important morning tasks. For kids, it will be exciting for them to go to school because they are wearing clothes they picked out. It teaches them the value of money. When you shop and let your kids choose their clothes, it is worthwhile to let them know your budget. This way they will understand the reason when they do not get what they want, and how to shop within a budget. This fosters financial responsibility at an early age and learning the importance of money earned through hard work. Children are very sociable; they do not need to be Facebook friends before they start talking and playing with each other. But that does not necessarily mean they can fit in, especially in groups. 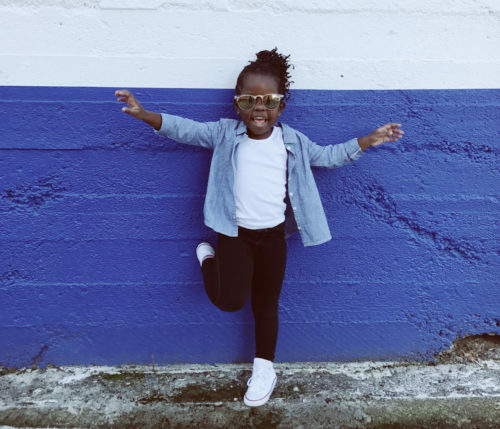 Just like adults, kids can be encouraged to dress to impress. Being able to wear the clothes they want can boost their confidence and can allow them to integrate into certain social circles. There comes a time when kids want to wiggle for a bit and look for a little control. As parents, it is your responsibility to shape them to be a good citizen in the world and teach them the value of confidence, time, money, independence, and to celebrate their individuality. A valuable lesson for your kids to know is that freedom comes with responsibility. And as we adults understand, responsibility fosters growth.